Chateau / Country House2200 sq. ft.
AS SEEN ON HGTV'S POPULAR SHOW LOG CABIN LIVING! We have a beautifully furnished 5 bs log home at AFFORDABLE RATES, situated at the base of the mountains on 2.5 acres adjacent to National Forests, in a quiet setting but close to everything. Based at the gateway entrances to both Grand Teton and Yellowstone National Parks, we have the full scope of outdoor recreational activities and amenities to make your visit to the mountains memorable. Groceries are 1 mile away in town of Victor. Driggs- 10 mi, Jackson- 26 mi. Yellowstone- 90 mi. Grand Targhee- 25 mi. See map. 2.5 car garage, with hot tub, pond and waterfall, beautiful pool table in garage. Large south and west-facing decks, and windows overlooking the mountains. We are in a rural setting on the sunny, west side of the Teton Range. We have a pond with waterfall and lots of open space with views. Floating on the pond and sunning on the decks are exceptional in the summer months. Highlights in the winter are the Hot Tub and the Wood Burning Fireplace. Spacious bedrooms are set up with a king bed in the master suite, a second king bed in a large bedroom, and 3 queens in the remaining three bedooms with one having a twin bunk above. The newly remodeled kitchen is an open layout for easy socializing with the dining and living rooms. It has a semi-circular granite bar with 4 high stools and gas stove in the island. Dining area has a table that seats 6-10. The living room is a cozy place for evening fires, TV viewing, family games, or simply reading or lounging on 2 large sofas. Ben is the owner an property manager and lives nearby the property. He is available to you for whatever needs you have, and to help you plan your trip to maximize your vacation time. He is very conscious of maintaining your privacy, but is more than happy to discuss your outdoor activities. Please contact him to discuss your plans. 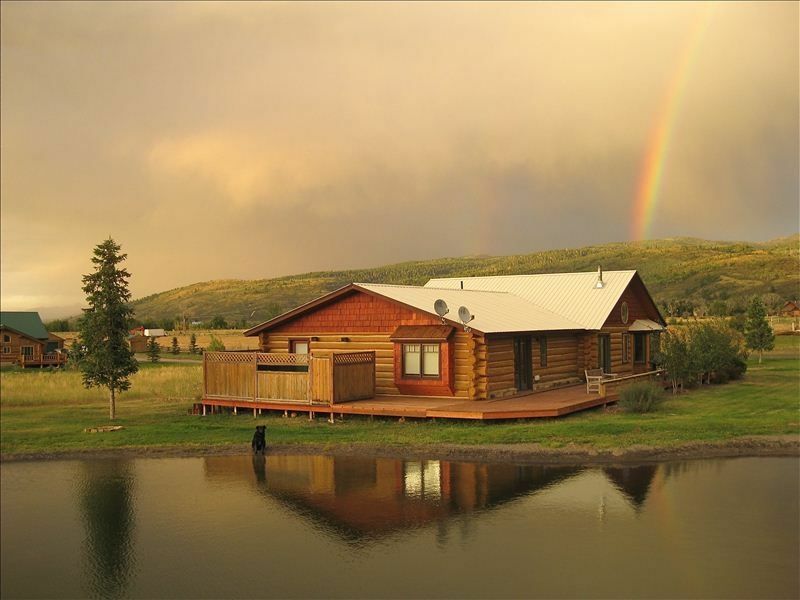 SUMMER: Imagine waking up to a Teton sunrise with horses running in the neighboring pastures and the tranquility of a truly private mountain setting. Then breathe in the clean mountain air and soak up the morning views. Your only concern is to decide between a hike up Coal Creek to Mt. Taylor, a day fly fishing on the south fork of the Snake River, a mountain bike up Pole Canyon right from the house, or a day tour at Teton Village in Jackson Hole. Or, you go on a raft trip down the canyon of the Snake River, golf at one of the six local golf courses in the area, a horse back ride up Darby Canyon, or a day on a scenic drive through Grand Teton and Yellowstone National Parks. Speak with Ben ahead of time to set up an itinerary for your trip. We will set you up with all of the famous local outfitters! WINTER: Wake up in the morning and decide which place to ski based on the morning snow report. Equidistant from Grand Targhee and Jackson Hole Mtn Resorts (30 min each). Or cross country skiing right from the house! If you walk across the street to Teton Springs you can skate ski or nordic ski their 10 K nordic track open to the public for free. Perhaps you like back country skiing and want to spend the day in some of the best back-country terrain in the Tetons just ten minutes from the house atop Teton Pass and Mt. Glory. Snowshoeing is accessible 5 min from the house up Moose Creek, Pole Canyon or Game Creek. Then come back to the log cabin for a warm hot tub and drinks by the fire. All of these activities are based from the comfort of a large but cozy log home offering a spacious living room with rustic hickory hardwood floors, bar, baby grand piano, fireplace and outdoor hot tub. Our large kitchen and atrium connect to the living room and offer great space for holiday parties. Spacious rooms with hand-peeled authentic log interiors make for private settings. Also a lovely bench seat window in the master offers a quiet resting spot to enjoy the waterfall view in the summer. The large master bedroom with walk-in closet offers a double shower head, jacuzzi tub, and a travertine tile bath. There are now 3 bathrooms including a Jack and Jill bath accessible from either side of two bedrooms. This bath has heated floors and nice tile shower. Extra bathroom is comfortable and nicely appointed with granite counter top and double sinks. A spacious laundry room allows for convenient upkeep during your stay. Sorry no smoking, dogs CONSIDERED. Look forward to your visit!! Ben is an active outdoorsman who spends his free time in the mountains or on a warm beach when on vacation. He works in the restaurant business, and in property management, is a handy man, and very knowledgeable about the area. He is available to assist you with designing your trip. This property is located perfectly to avoid the hustle and bustle of Jackson Hole in the summer, yet have easy access to both National Parks, and many trails right out your door for hiking and biking. With a quiet feel, and plenty of land, you won't feel crowded by neighbors, the forest is in clear view, and yet there is a full service grocery store 1.5 miles away. Great in the off seasons with even more peace and stillness, for anyone wanting a creative retreat. The clean mountain air and lack of crowds will leave you marveling that you have it all to yourselves. If you are looking for some nightlife or non-nature activities, Jackson is only 30 min away, and there is even live music in Victor! and in the summer its MUSIC ON MAIN free concert every thursday eve! across the street is Teton Springs golf resort. Need to be a guest of member or ask about property. 10K nordic track, Spa and restaurant are available to the public. other public courses near by. Hot tub, baby, DSL internet access, flat screen tv, Apple TV, yoga and spa, one basic mountain bike. Please ask about massage, and private chef options. Great location, spotless and roomy, awesome value for the dollar. Ben’s home is a wonderful retreat in a great location. His attention to details is unmatched, from a well stocked kitchen filled with all the little things you forget to take to ample storage for all the stuff you do bring. The outdoor seating is welcoming and well used, comfortable beds, ample linen, designer touches in lighting and fixtures. Terrific value for the dollar. Little tip: be sure to bring your passwords for your tv services, to experience the full potential of the smart tv. The cabin was lovely, comfortable and well-suited to our large family's needs. We were in Idaho for 8 days for a family wedding and the location was ideal. A short drive to Driggs and Victor and Yellowstone is accessible as well. It was also relaxing to sit outside on the deck or by the pond and waterfall in between activities. My only small complaint was that the dishwasher did not work well and we washed dishes by hand. But overall a great experience and I would definitely stay there again! Thank you Ben for sharing your beautiful cabin with us! Overall the house was very nice. Many of the windows did not open though (looked like they were being replaced), specifically in most of the bedrooms. Kitchen was well-equipped and had a good supply of necessities. The house had a lot of space and was conveniently located to Jackson. I'm not sure I'd agree that the house was "luxury," but it was nice. Ben was the best host! He answered all of my questions and came on to the property to do a few things. He couldn’t have been nicer. Our family all 14 of us came to celebrate the 20 year adoption making our family whole. A few were missing but we had the best time. Plenty of bathrooms to go around. The Pool table was an awesome hang out that the 40 and under could be as loud as they wanted when the older ones needed to go to bed. The hot tub was a huge success and the pond for the dogs and little ones. If we do a 25 year... this is the place we will come. Thank you Ben for allowing us to take over for a few days and just relax and spend time together. Fun was had by ALL!! Cool place close to Jackson. Loved the cabin, loved the host, loved the area. It was a bit further than Yellowstone than I thought but it was close to the Grand Tetons and Jackson. Dogs are considered on an individual basis.